Tonight, Jess and I got warmed up for this Sunday's mixed media art Meet-up. We made a brilliant mess of her dining table as we played with layering up a canvas and building textures. The piece I worked on was a crazy mix of background techniques. Love the way the watered down acrylic soaked into the wrinkles of the sewing pattern paper letting the text peek through in certain places. Had a ball stamping with found objects and realized that I really like the look of glossy paint on top of matte. 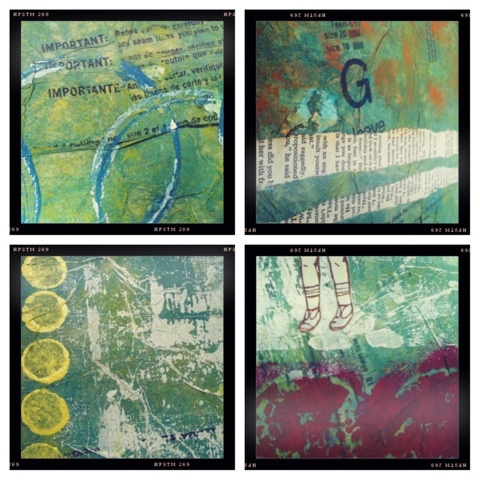 Found images, torn book pages and brayer roller streaks add even more layers and textures. The piece is not quite finished, but I thought I'd get some "swatches" of parts of the canvas. In doing so, I'm seeing each little swatch as it's own mixed media piece. Each one is a little study in composition and color combinations. It's neat to see how each little piece contributes to the whole. Mixed media layering is becoming a sure fire way for me to let go of the end result and enjoy the process, while I experiment with tools and techniques.